Two days of skiing did a number to my limbs. All I wanted to do all day today was sit down and take a load off. Tired eyes and tired legs need the time off. Bare all this in mind when reading these polishes names. 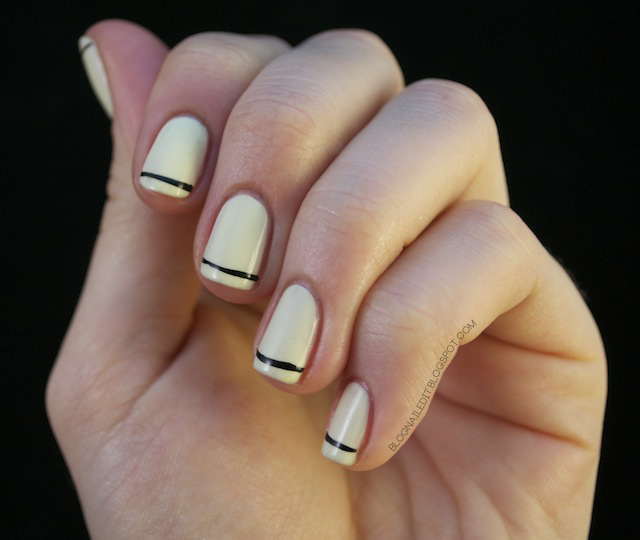 Elegant and simple, this manicure was inspired by my friend Tammy, who said she had seen something similar on Pintrest. I haven't been able to find the image she was talking about, nor do I know which colors they used, but I used Illamasqua Load and Sinful Colors Time Off. I know, so clever. About as clever as I can get without overstimulating my tired brain into a state of malfunction. This is so adorable! Simple yet perfect. So cool and creative, and love the names. Gorgeous! Definitely exemplifying the less is more concept! This is so pretty so simple-I love it! Thanks for your help with my blog! Not sure if you checked out the changes yet-glad you had fun skiing! I pinned a similar mani. It was glossy black with a silver strip. Nice to see that it works well with other colors, too. So simple but so perfect! I absolutely LOVE this!